This year my friends and I hoped not to exchange gifts because we all have a lot of other people we are buying for. We hope this will put less pressure on us during the holiday season. But we will exchange cards and Christmas family pictures. In October, when I visited my best friend we got to talking about fun things to do at Christmas to make it feel special but it needs to be easy. When you have kids (like she does) or are just busy (like myself) whatever you are going to do needs to be something you can enjoy without taking a long time to make it. 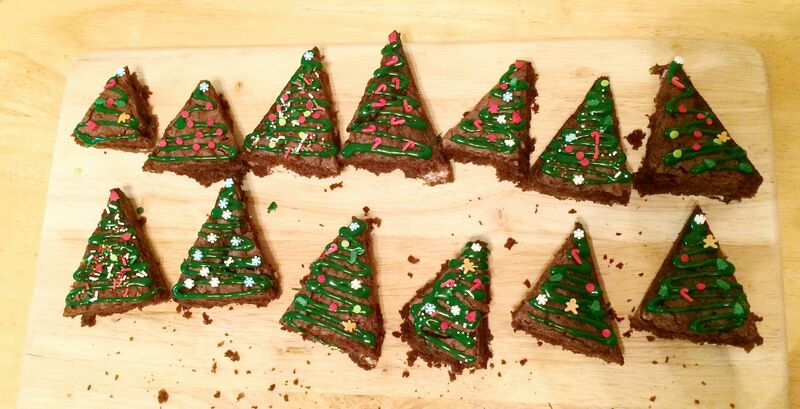 So Christmas Tree Brownies seemed like a fun way to make things fun without being too time consuming. Of course, you can always add these to your day of baking because I like the idea of making trays of different goodies and these just being one of them. You can use boxed brownies but I've personally decided that making them from scratch just tastes better. Of course, this is about time so your favorite recipe or boxed mix will defintiely work. 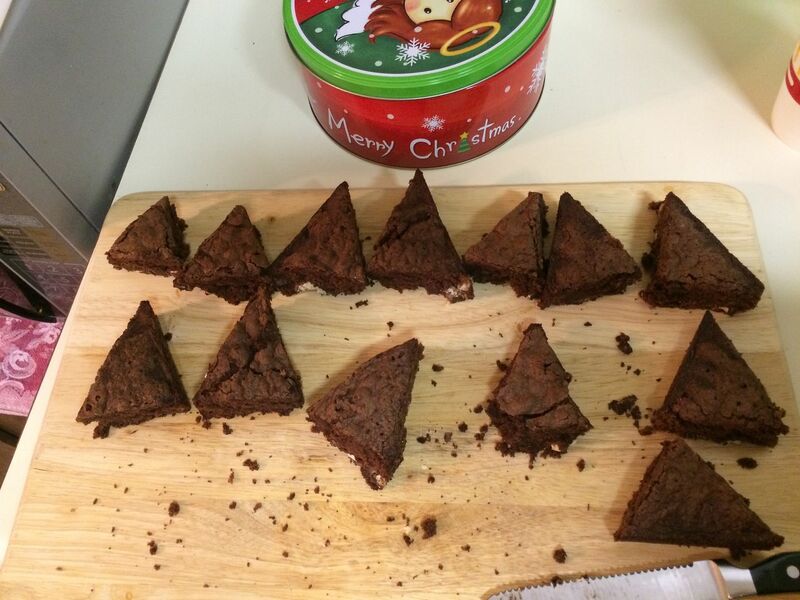 After you've made your brownies (and let them fully cool) you'll want to plan the cuts to get some good triangles. No need to make them perfect because what Christmas tree is perfect. 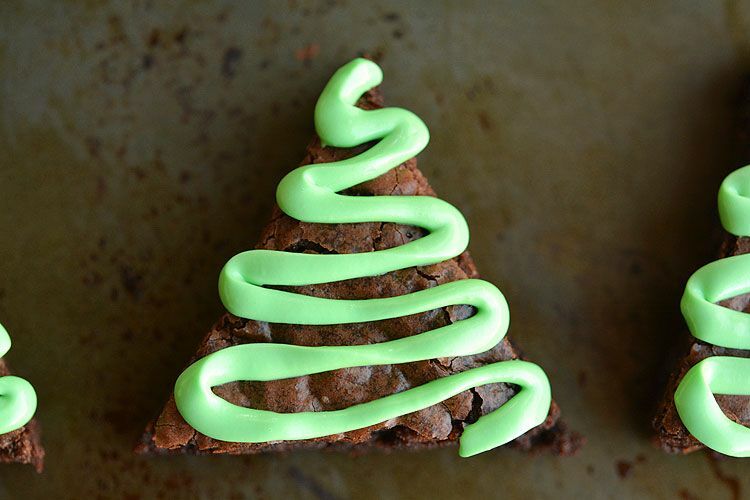 Once your brownies are cut, you'll need frosting. You can make it from scratch too or just by some green frosting which is usually available around Christmas time. When making it by scratch you will need the green food coloring. A recipe of frosting will likely use about 40-50 drops. But this depends on how much frosting your are turning green. I recommend experimenting and starting with a low number of drops and just adding more until you get the color you're seeking. 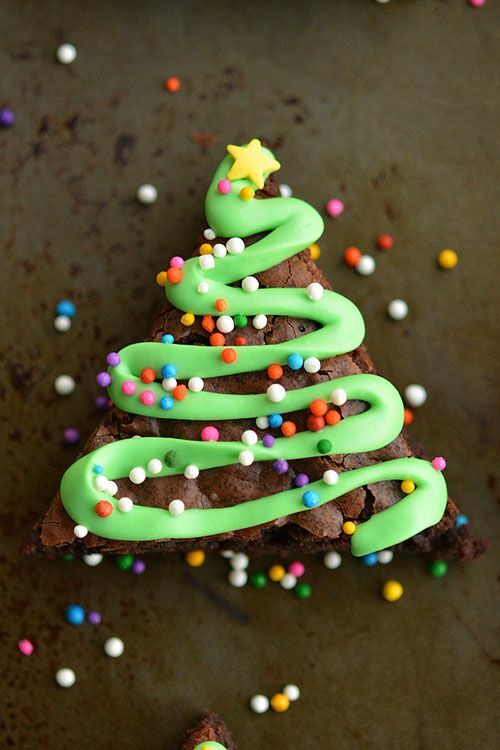 Squeeze out green frosting down the brownie and then move onto the sprinkles. You can scatter some of the round sprinkles or place them how you want. 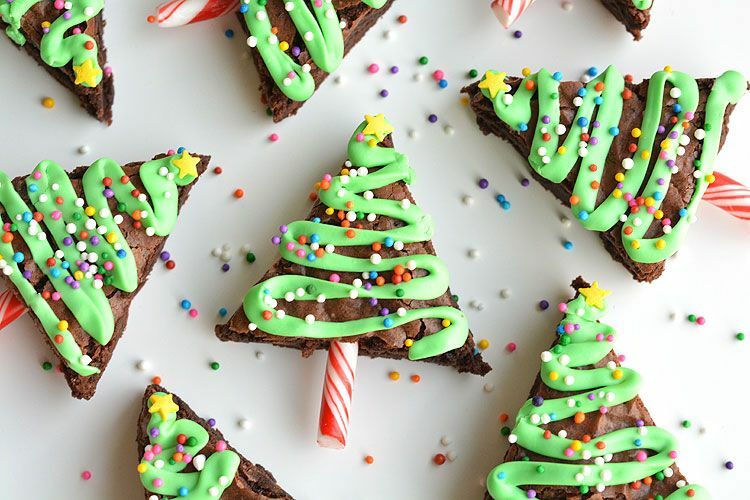 Add a star sprinkle to the top and if you've found those Christmas shaped sprinkles you can add snowflakes or snowmen or even some candy cane sprinkles to your tree. We didn't go with the image above which is the directional image. We did our own sprinkles. I also bought frosting which was a little darker. They needed to be cleaned up but after it looked great and people loved them. I think they are perfect at this point but if you want to give them a stem that is where the candy canes come in. You'll have to break them into pieces and stick them in the bottom of your Christmas Tree Brownies. I personally don't do peppermint but that is just me. What a brilliant idea! Def. trying! Right! I was so excited to find such and easy way to create such a fun treat. Mine aren't as good as the originals but they were just as delicious. I love this idea. Might have to give it a try when my oven is fixed. Well, I hope you oven is fixed soon and that your brownies come out looking wonderful!